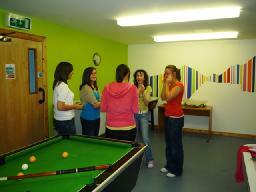 The Senior Youth Club caters for people of Secondary School age and runs on a Tuesday evening between 8pm and 10 pm. We have recently transformed the games room from ‘run of the mill’ into a funky room that can be enjoyed by all groups. A lot of thought went into the décor and we all really enjoyed doing the work ourselves. The Senior Youth Club recently won an annual unihoc competition for the second year running and we hope to retain the trophy next year. In order to raise funds we recently started with Avon Cosmetics. This is proving to be quite successful and we are grateful to all who have ordered from us so far and hope to retain their custom. With our Avon proceeds and recent bag packing in the Co-op we are hoping to go camping during the summer holidays. On a Tuesday night there are different activities to take part in, basketball, football, other sports, pool, darts, group games. Whatever we do, we have a good laugh and everyone enjoys themselves. Sometimes, the leaders are more entertaining than any game could ever be!